High chairs are a must-have for parents, guardians, daycares centers and healthcare professionals, to create a safe feeding place for infants, toddlers and preschoolers. With extensive research, our team has identified several of the best models on the market in the top categories including convertible high chairs, space-saving high chairs and portable high chairs. We outline the top features of each of our recommendations including durability, maneuverability, convenience and other important specs that should go into your buying decision. Read more about our methodology. If you want a high chair that gives you flexibility throughout the years, the Graco Blossom 4-in-1 Convertible model fits the bill. Its adjustability and ease of use make it plain to see why it's our top pick. The Graco SimpleSwitch grows with your baby, giving you two convenient seating options in one. It's easy to clean and folds down for simple storage, making it a good choice for apartments or smaller homes where space is a concern. When you're looking for a chair that doesn't break the bank, the Ingenuity Trio 3-in-1 Ridgedale high chair is a good option. It doesn’t skimp on the features and comes with a removable tray and seat cover, and the ability to seat two children at once. Compact and light, the Cosco Simple Fold high chair is a model that gives you what you need without the extra frills. It's easy to move where you need it and folds down for convenient storage and portability. The Evenflo Convertible high chair is an all-in-one solution that lets you feed and entertain children. 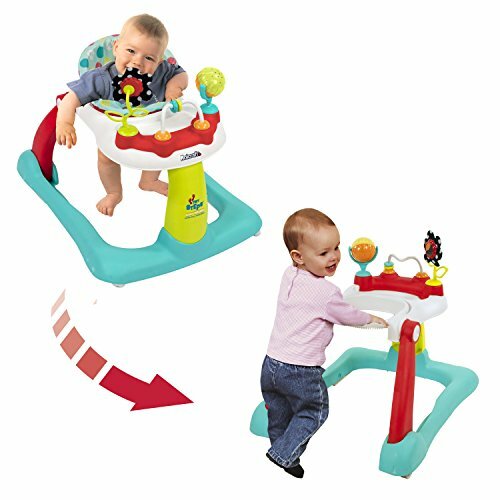 A removable base that converts into a table promotes individual feeding and doubles as an activity center. When it comes to saving space, the Fisher-Price Spacesaver takes up significantly less room than a standalone high chair. It straps to a regular chair, and converts to a booster seat for added flexibility to grow along with your child. The Cosco SimpleFold Deluxe model is designed for quick, easy use at mealtime. It takes up little space while in use and folds down between meals to give you an out-of-sight, out-of-mind feeding option. If you're looking for a high chair that's designed to last, the Abiie Beyond stands out. It transforms into a toddler chair as your child grows, and then into an adult chair that supports up to 250 pounds. One of the most important considerations to keep in mind is the length of time you plan to use the high chair. Those that convert into booster and toddler seats give you more longevity, lasting for years instead of several months. Most high chairs have a few built-in mechanisms that let you adjust the height for counter- and standard-height dining tables. A handle on the back of the seat makes it easy to recline for comfort or to slide children in. Hand latches allow for smooth movements and quick, convenient setup that takes only seconds. Children making messes is a fact of life, and high chairs that make cleanup easy are a must. Many come with removable trays and inserts that pop out, and fit conveniently in the dishwasher. Fabric seat covers should be stain- and spill-resistant with a wipe-able surface, or remove for machine washing to prevent odors. All high chairs and booster seats come with a 3- or 5-point harness system, and many have both. The 5-point system loops over the shoulders as well as the waist to keep smaller infants safely confined. The 3-point harness works well for older children with more motor control. Consider whether you want the chair to be a permanent fixture at your dining room table until your child outgrows it, or if you prefer to store it out of sight between uses. Compact and space-saving units work well in areas with a small footprint as you can place them in a closet or up against a wall until you need them. The price points on high chairs vary depending on the size and features you opt for. For around $50-$60, you can find models that fold up, with a reclining seat for added comfort. Mid-range models that fall between $75-$100 come with added benefits such as height adjustment and one-handed operation. If you need more features, such as convertibility, you'll have to spend a little more, around $125+ for a higher-end model. When it comes to versatility, the Graco Blossom 4-in-1 Convertible High Chair delivers. It has four different seating options and can seat two children at once with its two bases. It easily adjusts to fit multiple heights for tables or counters, and an adjustable footrest accommodates growing children. As an added bonus, the Graco Blossom is simple to clean with a plastic frame and tray, making it a must-have for busy parents and guardians. Grows with your baby. This high chair has a setting for infants, toddlers and even preschoolers. It converts from a standard high chair to a booster to a youth chair without the need for additional parts. Many users also cite the ability to seat two kids at once as an added bonus. Adjustable seating. Because dining setups differ between homes, the Graco Blossom high chair easily adapts to fit your needs. It has six height positions to fit at tables, countertops and islands, and three reclining and footrest levels to suit growing kids. Easy to clean. One-handed operation makes it simple to remove the plastic feeding tray for cleaning. The entire unit is made of plastic, so it's easy to wipe down between uses. Focus on security. With both 3- and 5-point harness systems, the Graco Blossom 4-in-1 high chair keeps your little one secure while you're at the table. When used as a booster seat, straps secure to the dining chair to keep it from sliding off. Hard to assemble. Some users have complained about the unit being difficult to assemble without help due to bulky parts. Leatherette pad is difficult to maintain. After several washes, some consumers have noticed that the included seating pad has started to fall apart. The Graco SimpleSwitch convertible high chair and booster combines two seating elements in one simple frame. Use it as a high chair with the legs for infants, and then remove the legs and tray attachment for toddlers and preschoolers who can safely sit at a dining table. A reclining back makes it simple to find the right comfort level for kids of all ages. The Graco SimpleSwitch folds nearly flat for convenient storage, so it's ideal for smaller spaces. Converts into booster seat. As infants grow too big to use the high chair, it's easy to convert it into a booster seat for older children. The legs come off and store flat. Despite this flexibility, several consumers have commented on how sturdy the unit is when it's set up. Easy to store. If it's necessary to conserve space between feedings, the Graco SimpleSwitch Convertible high chair and booster folds down for compact storage. The legs click into the footrest, keeping the unit securely closed until you need it next. 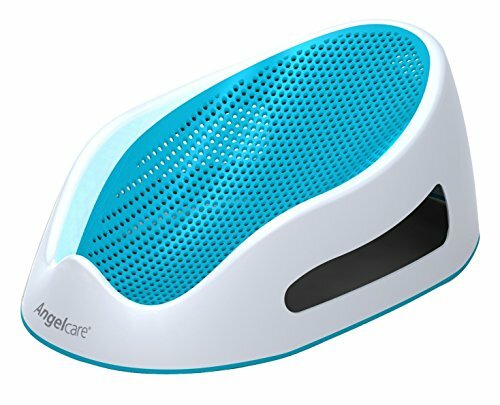 Machine washable seat for easy cleanup. The seat cover and padding comes off, and is machine washable for easy care. In between washings, a wet cloth is all you need to remove food and crumbs. No wheels. The Graco SimpleSwitch Convertible high chair doesn't come with wheels, which means you have to lift it to move it. Lack of tray cover. In order to clean the tray, you must remove the entire thing. There's no cover that pops up for quick cleanup. With three seating levels, the Ingenuity Trio is a must-have for houses with growing children. It's easy to adjust between the different levels and it's possible to sit two children with one unit. Both the seat cover and the tray remove for machine washing, which is an added bonus for spills. The Ingenuity Trio 3-in-1 Ridgedale high chair stands out in its category for its combination of affordability and overall versatility. Offers several seating options. There are three seating options with the Ingenuity Trio: high chair, booster, and youth seat. Seat more than one child. With the flexible design of the chair, it's possible to seat two children at the same time using the booster and the youth seat. The booster lifts off, leaving behind the other chair for toddlers or preschool-age children. Easy cleanup. Both the seat pad and the tray come off of this model, making it easy to clean and many users agree that it's simple to do. The tray and tray cover are both dishwasher safe, and the seat cover is machine washable. Small hole under seat traps food. Several consumers have noted that there is a small opening underneath the seat pad that can trap food and liquids. Some trouble assembling. Putting the chair together may take more than one person and can prove to be time consuming according to some buyers. 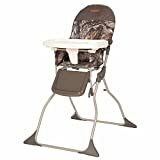 The Cosco Simple Fold high chair combines convenience and functionality. It lacks wheels, but its lightweight design folds down to a compact unit that's easy to take on the go and store away in small spaces between uses. However, this Cosco Simple Fold chair still provides a sturdy seating option for children who weigh up to 50 pounds. And, since setup only takes a few seconds, it's ready to go straight out of the box. Folds for compact storage. 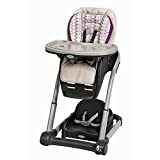 The Cosco Simple Fold high chair not only folds inward, it folds down too for compact storage that fits in a car trunk, against the wall or in a closet. It stands on its own without any propping. According to several buyers, folding it down and setting it up only takes a few seconds. Adjustable seat and tray. Both the seat and the tray adjust to accommodate babies and toddlers. 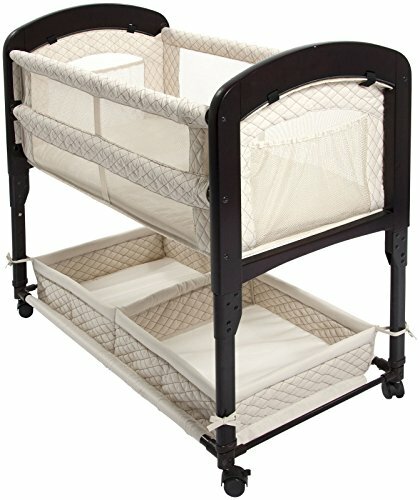 The back reclines for smaller babies and the tray slides out to three different positions as your child grows. Lightweight design. Since it doesn't weigh much, the Simple Fold chair is easy to move around and take on the go. Several buyers cited this as one of their main reasons for purchasing the Simple Fold chair. Seat cover does not come off. Some consumers have stated that the seat cover is not removable, so wiping down regularly is a must since you cannot toss it in the washing machine. Convertible high chairs give you the benefit of longevity. They're designed to grow with children from infancy to preschool ages, converting from elevated chairs that sit alongside a table to booster seats and sometimes beyond. Buying a convertible model means more cost-savings over the lifespan of the chair. Rather than lasting a few months until your child outgrows the seat, they last for years, with adjustable options such as removable trays and extending footrests that accommodate growth. Designed with flexibility in mind, this Evenflo convertible high chair makes it easy to feed and entertain children all in one unit. The high chair itself comes in a stacked design that converts into a "My Time" chair that you can use with or without the tray. The base converts into a table suitable for toddlers and preschool-age children for self-feeding or entertainment. Plus, you can take the chair on the go as a portable seating unit when you're away from home. Versatile seating options. This convertible chair works as a high chair and a regular seat with or without the tray. 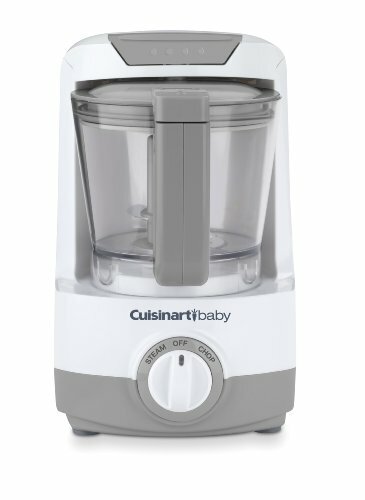 It also comes with a built-in table that removes easily for independent feeding or crafting sessions as your child grows. Its versatility is a main selling point among consumers. Machine washable components. The seat cover of this high chair comes off and is machine washable. The tray fits in the dishwasher and is easy to take off and put on with one hand. Setup is seamless. Right out of the box, this Evenflo model is simple to set up, without the need for tools. Many consumers say it was ready for use within 5 minutes of opening the box. Tray is not adjustable. The tray on this Evenflo Convertible high chair is designed for a fixed position. Several users complained about it sitting too far from the seat. Small leg holes. The leg holes tend to run on the smaller size, making it difficult to seat larger babies and toddlers. A space-saving high chair is a great choice if you live in a small home or apartment where every square foot matters. Instead of taking up valuable surface area around a table, they sit atop a regular dining chair. 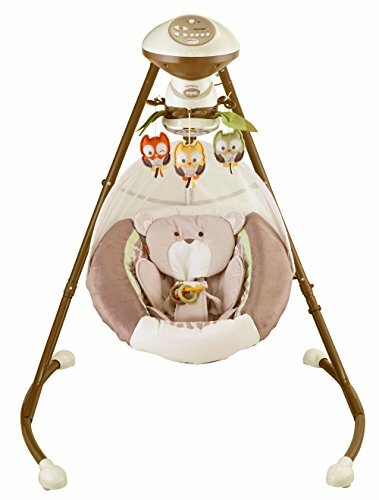 They have straps and buckles that secure to the bottom and back of the chair, keeping them in place, even if you have a wiggler. Much like your floor model, these units come with built-in trays and adjustable seats; they just give you the benefit of not having a bulky model take up valuable space. The Fisher-Price Spacesaver high chair gives you the features you need in a high chair in a small package. Rather than standing independently, it secures to a dining chair for use directly at the table. 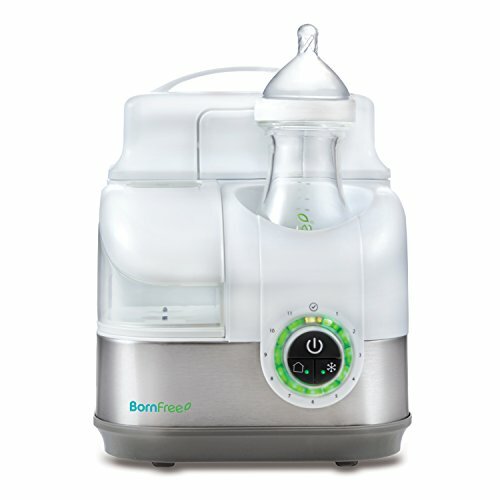 A convenient removable tray along with 3- and 5-point harness systems make it suitable for growing babies. The back comes off to convert the seat into a booster for older children, and its adjustable height gives you just the right fit. Saves valuable space. 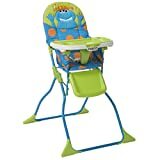 Unlike traditional high chairs that sit on the floor, this one attaches securely to a regular dining chair. It has straps on the back and the base that adjust to fit around the chair to keep it from moving while in use. Easy to travel with. Because it has a small footprint, this Fisher-Price Spacsaver chair is ideal for families who travel and need a simple, portable solution for feeding. Offers two seating options. For younger infants and toddlers who need the extra support, the reclining back offers stability. As your child grows, you can convert this Spacesaver chair into a height-adjustable booster seat by removing the back and the tray. Easy cleanup. Its ease of cleanup is a main selling point for consumers. The seat cover and tray come off easily for simple cleanup, and both are machine washable. Additionally, the seat cover is stain- and spill-resistant, so you can wipe it down between uses. Keeps necessities handy. 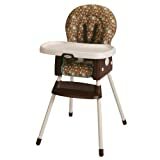 The tray on this high chair comes with a built-in Fastfinder Link that's ideal for hanging bibs and cloths to clean up your little one during meals. Several buyers indicated that you can also attach toys to keep kids engaged. Tray does not lay flat. The tray has a built-in leg divider slot that prevents the tray from lying flat when removed from the chair. In order to prevent spills, you have to clean the tray before taking it off, or place it directly in the sink. Not everyone likes to leave their high chair set up next to the table. If you're a minimalist and only want the necessities around, you'll appreciate an easy-to-store high chair. They have lever mechanisms that ensure they fold up nearly flat and easily rest against a wall or fit conveniently alongside a refrigerator. Pull the chair out when it's time to eat, and fold it back up after cleanup. Some are standalone models with self-supporting legs that eliminate the need for propping. The Cosco Simple Fold Deluxe high chair comes with the features you need for feeding time. 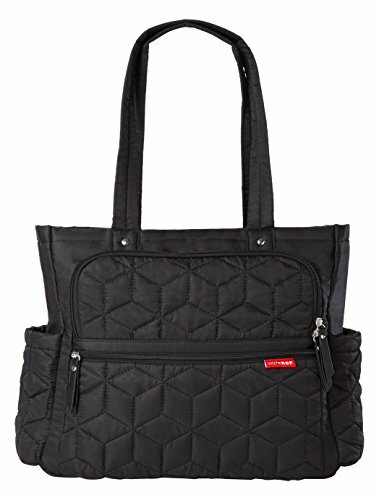 It's designed for quick cleanup with a tray insert that pops out for washing by hand or in the dishwasher, and a wipe-able fabric cover. 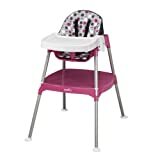 This Cosco high chair folds down without the need to remove the tray, and fits in compact spaces to save room. Its small footprint makes it easy to use at home or to travel with. Folds up compactly. 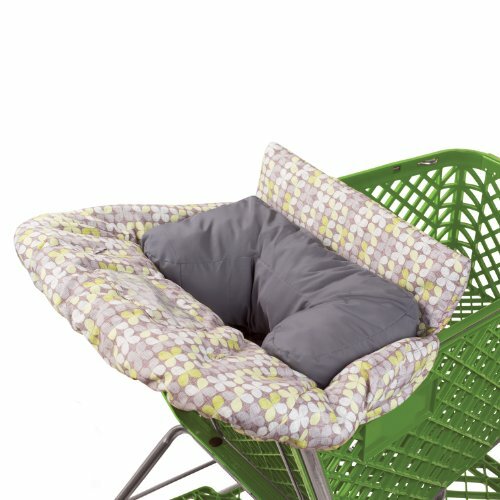 This chair offers the ultimate convenience in that it folds up flat for storage, without you having to remove the tray. It helps conserve space in small kitchens or dining rooms. Folding and opening takes just seconds by operating the latches on both sides. Adjustable tray. The tray adjusts to one of three positions so you can get the right fit for any age child. It also includes an insert that pops out for quick washing, which many purchasers cite as a plus. Travels easily. Due to its compact design, it's easy to travel with this high chair. It fits in a car trunk or truck bed. The back is not adjustable. According to several users, the back of the seat sits at a slight recline and is not adjustable. Seat cover does not come off. While it's easy to wipe down, the seat cover does not come off which is problematic when it comes to spills and mashed food that gets on the fabric. The majority of high chairs on the market have plastic frames, but if you're looking for something different, a wooden model adds a new look and feel to dinner time. They have solid, sturdy frames that come in different colors including oak, pine, maple and espresso. While they tend to lack some of the features of plastic models, they more than make up for it in aesthetics and durability. Some even convert into full-size chairs for teens and adults, giving you real staying power in your investment. A chair for the ages, the Abiie Beyond wooden high chair is one you can plan to have around for years. Its sturdy wood construction sets itself apart from many other models on the market, and its innovative design starts as an infant seat and transforms into a toddler and finally, and adult seat. It comes ready to use out of the box, and adjustments on this Abiie Beyond model takes seconds without the need for tools. Multiple seating options. The Abiie Beyond wooden high chair is designed to last for years. As children grow, it converts into a toddler seat and then into a regular dining chair for all ages. Quick, easy cleanup. The cushions on this chair are not only removable, they're waterproof and stain-resistant. Additionally, the plastic tray cover comes off and is dishwasher-safe, so you can put it in with the rest of your dishes after a meal. Higher weight limit. While many high chairs support children between 30 and 50 pounds, consumers love that the Abiie Beyond can hold up 250 pounds. Combined with its flexibility from a standard infant chair to a regular dining seat, it'll last for many years. Simple to assemble. The chair is easy to set up and takes approximately 15 minutes. A link to a video is included with the purchase that shows how to assemble with step-by-step instructions. No height adjustment. The Abiie Beyond high chair does not have a height-adjustment feature. It fits at standard dining tables, but is too short for counter-height seating. Small tray surface area. Some users cite that the tray is not big enough to fit plates and that food gets stuck in the crevices.